but she’s not out. 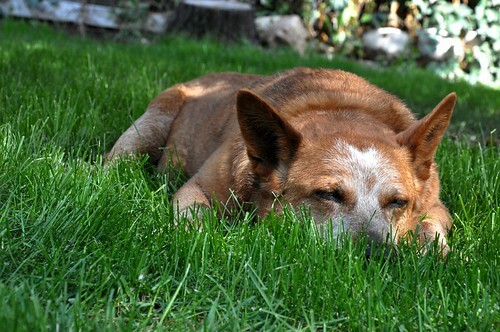 Technically, she is not even down anymore. Modifications: Worked body to 14.5” before joining sleeves. 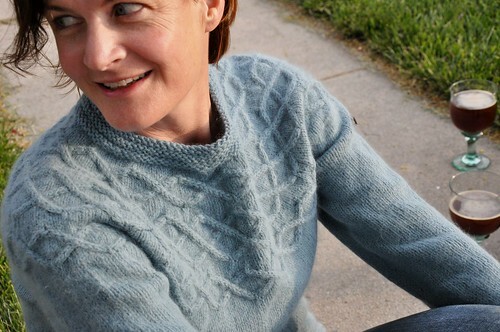 (longer than pattern – and possibly a bit too long for me). Worked 4 rows after bottom cable of body, then worked decreases every 6th row (instead of every 5th). Interestingly, the schematic shows a slow decrease angle and then a rapid increase angle, but the pattern dictates the opposite. Thoughts: I was hoping that the Lush would fluff up enough after blocking to hide the waviness caused by the decreases between cable rounds in the yoke. This is a main reason I stayed with the fluffy yarn even though it took 4 months to arrive. It doesn’t quite do the trick, however. I still like the look of the sweater, but i wish i could have done something about that. 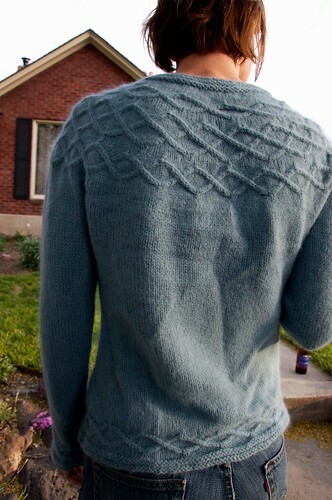 I like the drape of the sweater, however, and love how the back short-rows help the fit of the neck and give it a bit of extra length in the back. 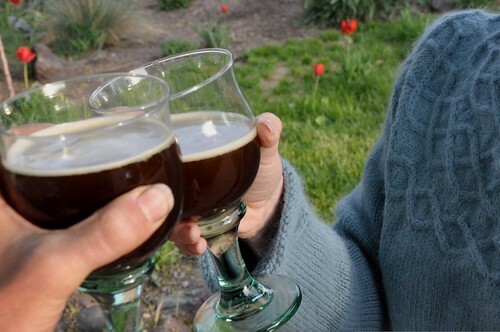 This entry was posted on Tuesday, May 11th, 2010 at 09:57	and is filed under a beer for every sweater, knitting. You can follow any responses to this entry through the RSS 2.0 feed. You can leave a response, or trackback from your own site. Ein schöner Pullover in einem tollen Blau! Gefällt mir sehr gut und die Farbe steht dir super. Hoffentlich geht es deinem Bein bald besser, Gute Besserung! I think it (and you) look great! Nice color with your eyes. 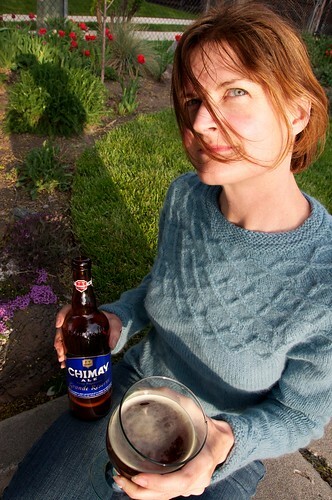 I’m not sure I’ve had Chimay blue; I’ll have to look for it. 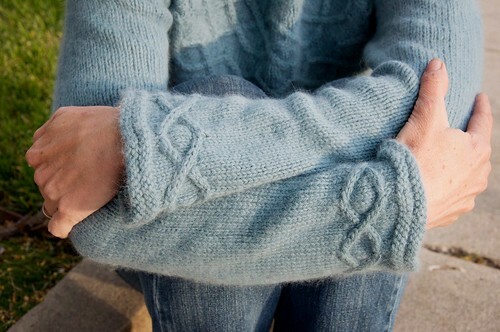 It’s beautiful, and I’d like to make it just to understand the sleeves. Isn’t it odd, how one knitter will do sweaters, while somebody like me will alternate between socks and shawls?